Reaching the finish of the event’s longest and most challenging stage without any issues, Pablo Quintanilla secured a solid runner-up result on stage four of the Atacama Rally 2017. 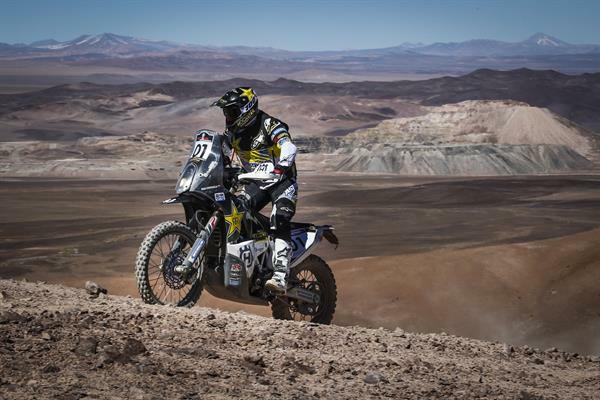 The Rockstar Energy Husqvarna Factory Racing rider is currently two seconds behind the provisional overall leader one stage before the end of the rally in Iquique. Receiving a two-minute penalty a few hours after the finish of yesterday’s stage three, Pablo saw his four-minute lead in the overall standings being reduced to a little more than two minutes. The first rider to start today’s stage four, the Chilean star was faced with the demanding task of opening the tracks for the first part of the special stage. Successfully completing the 375km-long timed special in a time of three hours and 55 minutes, Pablo earned the runner-up result for the day. As the rally now enters its fifth and final stage, the FR 450 Rally mounted rider is just two seconds behind the provisional overall leader, remaining well in contention for the overall victory. Featuring a timed special of 158km, tomorrow’s final stage will see competitors complete a circular route around the city of Iquique.